All three of these words are used to describe the actions of an herbacious plant or other types of botanicals when used as a medicinal, but what do they really mean? Newer to the Western mind, “adaptogen” is a word that has been used to describe certain herbs since the 1940s. As formally defined in Russia between 1950 and 1960, an adaptogen was an herbal substance with compounds that increase the state of non-specific resistance under condition of stress. To be termed an adaptogen, the substance had to be recognized to increase bodily resistance to physically, chemically, or biologically noxious agents or factors; to have a normalizing influence on a pathologic state, independent of the nature of that state; and be innoculous by not disturbing body function at a normal level. This definition put adaptogens into a new class of metabolic regulators that increase the body’s ability to adapt to and avoid damage by environmental factors. In 1998 the term was allowed as a functional claim for certain products by the U.S. Food and Drug Administration based on the accepted criteria. 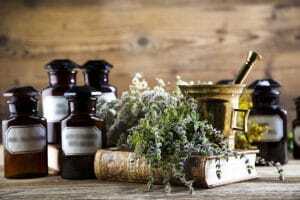 For quite some time, the term has been used to describe herbal products of plants that appear to meet the criteria –on the basis of the ability to have stimulating and restorative effects while increasing resistance to stress– but without experimental evidence to support all the criteria for the formal definition. Generally speaking, we think of adaptogenic herbs from a traditional perspective that have been known to help prevent imbalances that can result from stress and may, if taken regularly, prevent or minimize disease while not over-stimulating nor preventing normal bodily function. Renown herbalist, David Winston describes an adaptogen with this example: “…if the immune system is depressed, adaptogens enhance the immune response. If the immune system is overactive—for instance with allergies—adaptogens help re-regulate the immune response, decreasing overactivity.” So adaptogens facilitate these changes through a wide range of actions, rather than one specific action. Then, there are some botanicals like Reishi and Maitake mushrooms that may not be adaptogens in the strictly defined sense, but each has adaptogenic properties, among their many other benefits. Here is a list of some of the clinically researched adaptogens that are available from Beneficial Botanicals in tincture form. The word “tonic” in the Western herbal traditions is relatively vague and can be insignificant for evaluating the actions of herbals. Some herbalists use the term to mean a botanical that invigorates or strengthens, having a general effect on the whole body. In the 27th edition of Dorland’s Illustrated Medical Dictionary a tonic is defined as “a medicinal preparation believed to restore normal tone to tissue”. What does that mean? What tissue –muscle tissue, brain tissue, neural tissue? What kind of toning –building up, enhancing, heightening, increasing? Adaptogens might be considered a tonic in some way, but it is clearly improper to assume that “tonics” are adaptogens because they do not meet the criteria for the definition of an adaptogen. Not to be confused with the word “alternative” –watch out, Google will change it for you!– the word “alterative” has had many definitional references over the centuries. As quoted in 1621 from the book “The Anatomy of Melancoly” by Robert Burton, an alterative was thought to be a medicine or treatment which works by “changing processes within the body, rather than by evacuating something”. In the medical industry during the 1980’s an alterative was described as “an obsolete term originally used for drugs said to re-establish healthy functions of the system”. The medical definition was updated more recently to “a drug used empirically to alter favorably the course of an ailment”. But this is still a little different from the definition as defined by modern day herbalists. According to the Naturopathic Herbalist, alteratives are herbs that gradually restore the proper function of the body and increase health and vitality…and, many herbs have an alterative function and can commonly be their secondary or tertiary action. Here is a list of some of the alteratives that are available from Beneficial Botanicals in tincture form.